The US owned Blastrac BV in the Netherlands comes from a company with roots dating back to the early 1900s. 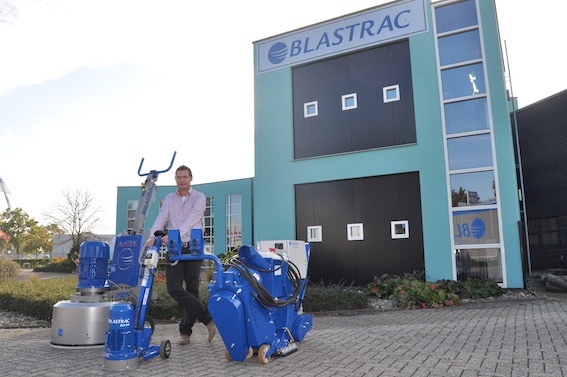 With the brand name Diamatic, as part of the group since 2005 and a focus on developing a wide range of machines and tools for floor preparation, the Blastrac group has radically increased its presence in the market. Jan Hermansson reports. Blastrac is a multinational company with over 300 employees worldwide and a turn over of €100M. It acquired Diamatic in 2005 and the Diamatic brand steadily took market share in the US and Europe, where the floor grinding and polishing industries were rapidly expanding. 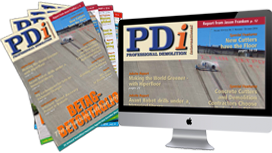 In the US Diamatic became the brand for concrete floor grinding and polishing, while Blastrac in the US is focussing on shotblasting and scarifying. In Asia and Europe Blastrac is the brandname covering the complete floor preparation portfolio. Blastrac and Diamatic are both the full line providers of different floor systems. The range is huge and the company also offers a large range of additional methods for concrete preparation and removal of different types of floor coatings, such as shot blasting, milling and scraping. For Blastrac it all started with shot blasting. The first portable shot blasting machine was developed in 1978, but the company has roots dating back to 1906 when the predecessor American Foundry Corporation was founded. The company became well-known for its static large machine called Wheelabrator, which had several wheels that threw the abrasive at the surfaces to be processed. This was an alternative to the compressed air type of blasting in use at the time. But with the new Blastrac portable shot blasting machines the company rapidly became market leader and in 1980 production also started in Europe. In 2013 Blastrac introduced its own line of diamond tools in Europe covering diamond sawing blades from 125 to1610mm in diameter and core bits from 10 to 600mm in diameter. Currently Blastrac is focusing on sales of its new Diamatic diamond tool line on nearly all European countries. Blastrac has 55 different products covering grinding and polishing machines, scarifyers, shot blasting, steel blasting, equipment for removal of hazardous material, shot blasting for steel surface preparation, machines and tools for decorative flooring, equipment for maintenance of runways and highways and different kinds of dust collecting systems. There are 10 base models of grinders and polishers, plus ride on machines with three planetary systems on each and integrated dust extractors. The shot blaster line contains 12 standard models, the scarifyers have four base models, the steel blaster line has seven standard models, and there are two models of floor strippers and a line of dust extractors, pre-separators and cyclones containing 12 base models. Blastrac also has its own tooling line called DiaMag. DiaMag tools were launched in 2010 and were originally the name of Blastrac’s patented quick connection system. Blastrac Europe has its own subsidiaries in UK, Germany, France, Spain, Poland, Ukraine, Italy, Australia, Middle East and India, which have been built up since the beginning of the 1990s. There are also a number of distributors in other parts of the world, including Africa and South America. The North American market is taken care of by the US organization with head office in Oklahoma. The head office for Diamatic is in San Diego, California. Blastrac Asia is based in Shanghai, China. Blastrac has 12 different models of machines for grinding and polishing from 180mm to 780 mm working width. The three head planetary belt driven system is patented and some of the machines are remotely controlled. The latest is the BMG-555, which was introduced at the French trade show Batimat in November. For the moment Europe is quite a way behind on polishing comparing to the US, about 80% of the grinding jobs is floor preparation and the remaining 20% polishing. The strategy for the near future is to continue to open its own local sales offices in various countries. “To be present in the market with our own organisation we believe is the best way to go. Long-term organic growth is our priority,” said van Vliet. He also emphasises the value of setting up training and service centres at each subsidiary to reach out to clients and educate them in how their products work. In Poland Blastrac just opened a centre of excellence with a fully equipped demo centre where Van Vliet believes that Blastrac has a good chance to grow extensively in all markets where they are currently present. He points out that Scandinavia is of particular interest.